Linfield new boy Louis Rooney had a debut to remember after scoring a quickfire hat-trick in the 6-0 hammering of Lisburn Distillery in the League Cup. It was an easy night’s work for Linfield as they top-scored by smashing the Whites for six. Matthew Clarke, Andy Mitchell and Josh Robinson on target before Rooney stole the show with three strikes for the Premiership leaders. The striker signed from Plymouth Argyle last week and he bagged an eight-minute treble to make the perfect start to his Windsor Park career. “I’m absolutely delighted - to get on the pitch was great but to get three goals was perfect. opefully it is the first of many. “It was good to get on the scoresheet and said Rooney. Ards claimed their first win of the new season with a comfortable 5-0 victory over Queen’s University. Ards opened the scoring in the 17th minute when Kyle Cherry unleashed an unstoppable 20-yard volley that rocketed into the top corner. Cherry added another goal in the 27th minute. David McAllister produced a fine cross from the left wing that the midfielder guided home with his head. Michael McLellan opened his Ards account in the 54th minute. Cherry lobbed the ball towards the back post and the former Linfield striker was on hand to tap home from a yard. McLellan scored his second in the 74th minute when he headed home a superb McAllister cross. McLellan turned provider in the 79th minute. He whipped the ball in from the right and his former Harland & Wolff Welders team-mate was on hand to volley high into the net at the back post. Cliftonville donned their shooting boots at Solitude last night as they defeated Banbridge Town 4-0. It was Chris Curran who opened the scoring on 10 minutes before Donnelly’s close-range header extended the hosts’ advantage. Donnelly then made it 3-0 with a strike early in the second period before Joe Gormley wrapped things up by applying the final touch. Institute needed penalties to end Moyola Park’s Challenge after a 1-1 draw after extra time. Coleraine reached the third round of the BetMcLean.com League Cup after a convincing 4-1 victory over Larne at The Showgrounds. 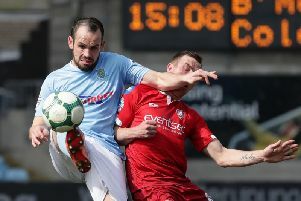 After a subdued opening half hour, Oran Kearney’s men scored three times in six minutes to put the tie beyond the Bluefin Sport Championship side. The goal blitz started on 31 minutes when Joe McCready tapped home from close range after Eoin Bradley missed a spot kick, before David Abe could only deflect Ian Parkhill’s shot into his own net. McCready was to bag his second on 37 minutes when he ran onto Brad Lyons’ through ball and finished into the bottom corner. The Bannsiders added a fourth midway through the second-half as a strong run from Ian Parkhill teed up Darren McCauley who stroked home into the bottom corner. Tiernan Lynch’s side managed to grab a consolation goal on 75 minutes when striker Daniel Reynolds volleyed home past Chris Johns, but that was as good as it got for the visitors as Coleraine ran out worthy winners. Dundela shocked Premiership boys Crusaders by taking the lead on 16 minutes at Seaview when Jordan Hughes drilled home a pass from big striker Mark McClelland. Mark McAllister then drilled home a beauty for the Crues and only 60 seconds after the interval with Ryan Nimick sweeping home. Darren Henderson produced the finishing touch to a frantic first half that served up five goals -securing Portadown safe passage past a spirited Harland and Wolff Welders side. Ross Larkin marked his first start of the season by breaking the deadlock then the teenage centre-back suffered own goal misery to level the match. Peter Duffin then scored for the Ports but the Welders hit back again to make it 2-2, but Portadown grabbed the final goal of the game through Henderson after good work by Lavery. Ballinamallard United progressed to the last 16 of the Bet McLean Cup last night, but Premier Intermediate side Tobermore Unitd made them battle all the way. Normal and extra-time failed to settle the stalemate as the game finish scoreless and it went into penalty kicks. The sides were still level after 14 kicks before McLaughlin scored for the Fermanagh men and keeper Crawford save the visiting effort for an 8-7 victory. Cup holders, Ballymena United, put their poor league form behind them to book a third round place winning 3-0 aginst Knockbreda. The Sky Blues made a dream start at The Showgrounds with Caithar Friel scoring after just 32 seconds. David Jeffrey’s side made sure of victory - and their first win of the season - in the second half with goals from Joe McKinney and Willie Faulkner. Glentoran suffered a shock exit at this stage last season and must have been fearing the same fate as their tie at Loughgall ended scoreless after 90 minutes. However, John McGuigan grabbed the all important winner in extra-time. Glenavon suffered an early blow before bouncing back to beat Donegal Celtic 5-1 at Mourneview Park. Declan Monaghan stunned the home fans by giving Celtic the lead, but the Lurgan Blues came storming back thanks to a first half hat-trick from Mark Sykes and a Jack O’Mahony equaliser to lead 4-1 at the break. Glenavon dominated the second half but added just one more to their tally through Bobby Burns. Dungannon Swifts were on top to win 4-0 at Newry City, Ballyclare Comrades got the better of Newington 2-0 and PSNI had a narrow 1-0 win at Limavady United. The other two ties to go the distance were decided with a penalty shoot-out as Institute beat Moyola Park and Ballinamallard United edged past Tobermore United.